Recently I've been trying out and loving more natural and organic skincare brands like Trilogy and Weleda. I love the idea of using natural ingredients and it seems like my skin is all the better for it. I was recently invited to try out Irish organic skincare brand YouOrganic founded in 2012 by Ursula Elmes who was an Acupuncturist and a Holistic Skin Therapist. Ursula began experimenting with Organic skincare after she had a bad reaction to a skincare product and this sparked an interest that would later develop into YouOrganic. 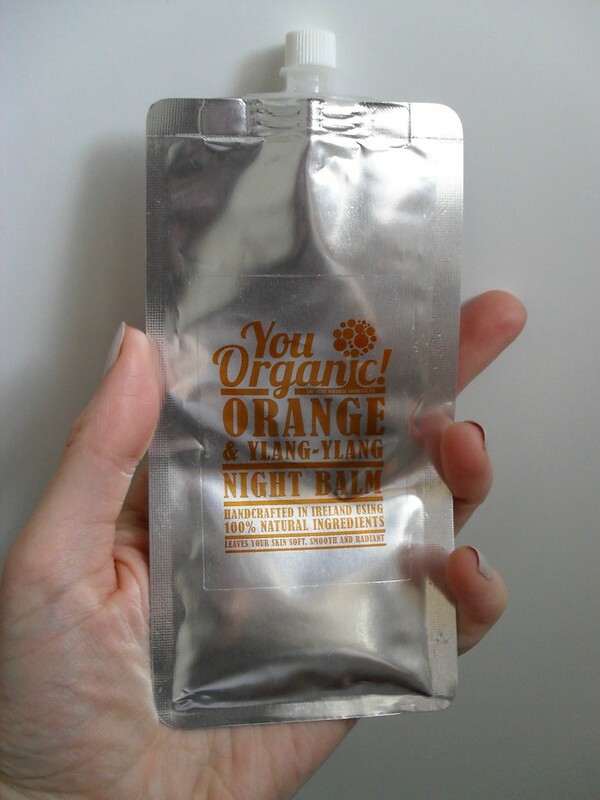 For the past while I've been using the Orange and Ylang Ylang Night Balm which is a 100% natural product that promises to nourish and rejuvenate the skin and also contains antioxidant ingredients. I absolutely loved this product from the first use. It contains essential skincare ingredients like Vitamin E, Aloe Vera and Cocoa Butter as well as Almond Oil, Neroli, Bergamot and Ylang Ylang. Like it says on the packaging, a little goes a long way and the 20ml pouch has lasted me a long time. The only thing I found a bit tricky was dispensing the correct amount from the pouch as the texture of the product can change depending on the temperature of the room it's stored in but if you're careful and take your time it shouldn't be a problem. As I've probably mentioned before I have normal/combination skin so I found using the balm every other night has worked best for me. I've used it alone and beneath a moisturiser as more of a treatment/serum but to be honest I found it worked so well alone that you don't even really need a moisturiser on top of it. I love the mild citrus scent and the texture which is easy to apply and absorbs into the skin quite quickly. I've really been enjoying using this and I feel like it gives my skin such a nice overnight treatment and has helped with any dry areas which I can suffer from on occasion. I can't wait to try out more products from the YouOrganic range, particularly the Orange and Mandarin Lip Balm and the Orange and Cinnamon Wood Wick Candle. The Night Balm is €29.99 and can be purchased from the YouOrganic site with Worldwide shipping as well as from several Irish stockists. There is also a Botanical Apothecary Studio on Mary Street in Dublin where you can book an appointment for an organic facial. What do you think about Organic skincare?